John McDowell, the third provost of the College, was born in Peters Township, near Chambersburg, Pennsylvania, in 1751. He was the son of William McDowell, justice of the county, and Mary (Maxwell) McDowell, who were Scotch-Irish farmers. He lived intermittently within a stockade, for his log home was burned down twice in Indian raids during the French and Indian wars. McDowell had a good elementary education, attending John King’s Latin school for three years until it was destroyed by Indians in 1763. It was King, a graduate of the College of Philadelphia, who arranged for McDowell to gain entrance to the institution in 1768. 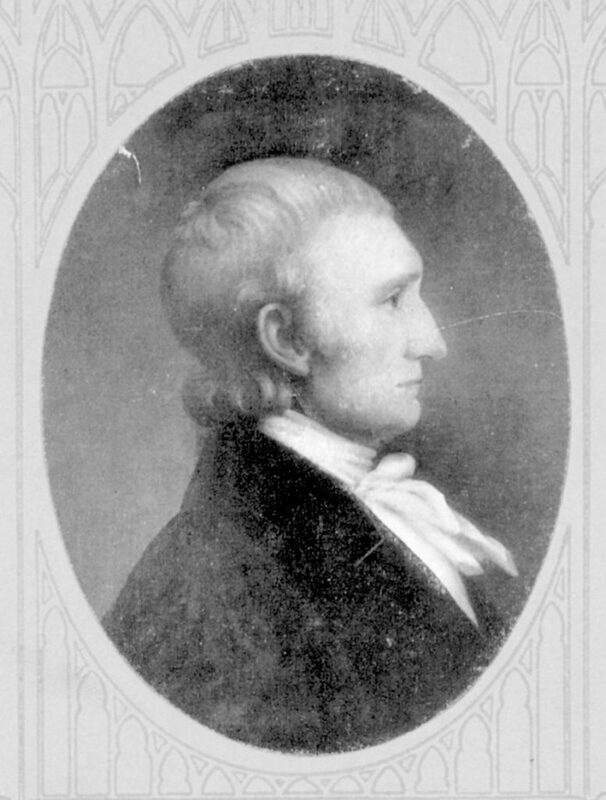 Because he lacked funds, McDowell tutored in lieu of tuition and board, graduating from the College in 1771 after giving the English oration titled “On the Advantages of Studying History.” He continued tutoring there for eleven more years. In 1777, McDowell served as a private in the Continental Army, but resigned after only a few weeks because he was unable to stand the hardships of life there. In 1782, he moved to Cambridge, Maryland, to study law, simultaneously teaching at a local school there. McDowell gained admittance to the Dorchester County bar in 1783 and conducted a lucrative law practice with many of the state’s important landowners. Through his connections, McDowell was appointed professor of mathematics and acting principal at the new St. John’s College at Annapolis in August of 1789. As a Federalist, he defended the college’s receipt of state funds against Republican legislators who demanded that all public money for education be given to lower schools. Discouraged by the constant uncertainty about funding, he resigned in 1801. Even though the trustees persuaded him to remain, he resigned again in 1806 when the college lost all state funds. Later that year McDowell returned to Penn, now the University of Pennsylvania, as professor of natural philosophy in the College. He became the third provost in 1807, the first graduate of the College to be named to that office. These were hard years for colleges in general, and for Penn’s College in particular; the College maintained a course of study of only two years, and enrollment fell in 1807 to just seventeen undergraduates. Although McDowell was a good scholar, writer, and teacher, he could not improve the situation because the trustees allowed him little more than disciplinary duties. Ill health forced him to resign in 1810. However, in recognition of his earlier work, McDowell received an honorary LL.D. from the University in 1807 and was also elected a member of the American Philosophical Society that same year. In 1811, McDowell returned to live with relatives in Franklin County, Pennsylvania, where he again practiced law. In the following year, St. John’s College once more offered him the principalship, which he declined, but finally accepted in 1815. By 1816, he regretted this decision because of the difficulties of higher education in Maryland, and left in 1817, when the board temporarily closed the college. In 1818, McDowell became ill and spent much of his last two years at Governor Charles Coldsborough’s home near Cambridge, Maryland. He returned to his sister’s home near Mercersburg, Pennsylvania, late in 1820, where he died on December 22. Since he never married, McDowell left an estate of $40,000 to his relatives and most of his library to the University. McDowell was sometimes described as a delicate man with a character “of an almost feminine gentleness.” However, he was a dignified, kind, Christian gentleman, and was held in high esteem by planters, scholars, trustees, former classmates, and students.